A company in Okemos, Michigan, has fired employees for refusing to take a test to show if they were using tobacco. Not that they were smoking in the workplace mind you, but merely that they were using a legal substance on their own time outside of the workplace. Okemos-based Weyco Inc.'s firing of four people who refused to take a test to determine whether they use tobacco has a lot of Michigan workers wondering whether they might be next. This certainly raises a question as to how far employers may go to control their employees activities that take place on their own time. While it is legal for Weyco to have done what it did, it may prove to be going to far. The Mayor of Detroit, Kwame Kilpatrick, admitted Saturday that the new 2005 Navigator was in fact for his family's use and was not purchased as an undecover police vehicle or for the police chief. After a weeklong assault, Kilpatrick tried to regain some of his flagging credibility Saturday, when he reversed himself and admitted that the shiny new Navigator reporters found in a locked police garage originally was leased by the city for his wife, Carlita Kilpatrick. "There were some screwups on communications," Kilpatrick said during an unprecedented and sometimes combative 70-minute news conference in his city hall offices. "I'll take the lumps on that. I'm upset that we handled it the way we handled it." Woow, denials, false claims and outright lies were simply "communication screwups". Yeesh, if the guy had just said "Yes its for my family, yes it was purchased for $24,995 so it didn't meet the $25,000 cut-off for Detroit City Council Scrutiny big deal". Most of the fuss would have been erased in an instant. However, the Mayor's office still seems to be having more "communication screwups"
He [The Mayor] said he had nothing to hide, then sat quietly while his police chief distributed lease documents from which the names of key subordinates -- subordinates who could confirm or dispute the administration's account of the Navigator lease -- had been excised. Apparently the Mayor still can't come clean on the deal. In addition to the potential Navigator errors that may have taken place, the mayor is also embroiled in a lawsuit. In the suit, an affidavit filed by Metro DC police officers state that they ceased providing after-hours protection because his frequent nightclub-hopping might result in injury or public embarrassment to their officers. Hizzoner da' Mayor of Detroit, Kwame Kilpatrick is in a bit of trouble again. This time it's caused by a questionable lease of a Lincoln Navigator and his bodyguard's caught-on-TV roughing up of a reporter asking about the Lincoln as reported in The Detroit News' article Mayor's guard faces review after clash. Last year the mayor's wife had a City-leased Lincoln Navigator issued to her. This year the plates assigned to her showed up on a brand new Lincoln Navigator, for which the administration paid 24,995 to lease - $5 below the amount that requires reporting to the City Council. Stories about the new Navigator have varied from it being the Police Chief's car to being an undercover vehicle. While the local media may let a fair bit of the accusations levied against the Mayor in the past slide off the radar, the roughing up of one of their own likely isn't to fall of the press' radar screen anytime soon. HonestReporting.com, a group that watches for anti-Israel bias in the news sadly always has their hands full trying to keep up. Even so, they do a fantastic job. Take todays report from them concerning The Scotsman's incredibly misleading headline. The Headline to the articlereads: "Sharon's phone call to Abbas sparks new wave of violence". ARIEL Sharon, the Israeli prime minister, yesterday phoned Mahmoud Abbas to congratulate him on his election as Palestinian president and offer co-operation, the highest-level contact between the two sides in nearly four years. But even as the two leaders extended efforts to make peace, Palestinian militants resumed rocket and mortar fire at Jewish settlements in Gaza. As Honest Reporting points out, there is absolutely no evidence the phone call, and a non-threatening and congratulatory phone call it was at that, had anything to do with the attacks by "militants" (note shelling a residential area to attack civilians is not the act of militants but of terrorists. One wonders if the Scotsman reported the IRA bombings against London pubs and shopping centers as the acts of militants....I think not. Once again Honest Reporting makes clear the media bias against Israel. Just heard about this in the office over lunch. Justice Elizabeth Weaver of the Michigan Supreme Court has just announced she is stepping down in October, to apparently protest term limits. The Republican (RINO) Supreme Court Justice is stepping down now, knowing she will be replaced by a justice appointed by the current Democrat Governor Granholm. This will change the current composition of the court from 5 Republicans and 2 Democrats to a 4-3 Split. Apparently she claims she is doing this as a protest over term limits. What the true motivation for the decision is unknown. Justice Weaver was the lone dissenter in the vote held this month by the Court appointing conservative Republican Taylor to be Chief Justice of the Supreme Court so methinks there's more to this than a protest over term limits. Though a Republican nominee, it has not been uncommon for Weaver to join the court's two Democratic nominees in 4-3 rulings. "I am grateful to have had the opportunity to serve Michigan as a common sense, independent, and self-disciplined judicial thinker," she said. "I am a judge who is a Republican, not a Republican who is a judge." Democratic Gov. Jennifer Granholm will get her first chance to appoint a justice to the Supreme Court. The 2005 Detroit Auto Show is now on, and this being Detroit, The Show is the front page item in both the Detroit Free Press and Detroit News. All sorts of concept cars and new production vehicles. Jeep may produce the Jeep Gladiator pickup truck which is on display at the show and also showcased the Hurricane concept vehicle - A Jeep with two Hemi engines - lots of power and performance. The Detroit News offers a very cool Virtual Tour of the Autoshow that is well worth perusing. Will the Palis miss yet another opportunity? Its been said that the Palestinians, and the Arab world at large for that matter, never "miss an opportunity to miss an opportunity". Now with the election of Abbas, the question is what opportunity do they now have an opportunity to miss? Will Abbas keep up the good cop / bad cop charade that Arafat had going? Will he maintain the practice of saying one thing in English to the Europeans and Americans and quite anotherin Arabic? Will he maintain the autocratic, corrupt style of government of Arafat or make real strides towards a free society? The Arab track record for peace, democracy, and reform thus far hasn't been very promising. • Dissent. Under Arafat, the only freedom of speech or press was the freedom to criticize Israel. Abu Mazen must understand that the days of crushing democratic dissent are over. If Palestinian democrats know that the Free World will not allow the PA to act toward them with impunity, then an increasing number of democratic voices will be heard. • Education and Incitement. In any society, what is taught in public schools and broadcast on public airwaves is a good indication of the values that are being inculcated in its people. PA-run schools and the PA-controlled media have been used to poison a generation of Palestinians against Jews and Israel. The Free World must demand that this end immediately. • Refugee Camps. A PA dedicated to bettering the lives of its citizens will immediately seek to address the miserable conditions of Palestinians who have been living in refugee camps for four generations. A PA interested only in controlling its subjects will prefer to continue to use these Palestinians as pawns in a political struggle against the Jewish State by feeding fantasies that they will return to pre-1967 Israel. The Free World should express its willingness to fund a program that provides decent housing for those living in the camps. A PA leadership that rejects such a plan is not interested in the welfare of its own people and hence not a partner for peace. • Economic Independence. In a fear society, people are cogs of the regime. That is why one of the anchors of a free society is a middle class not dependent on government largess. With a monopoly over basic industries, and the power to decide who receives work permits to Israel and who receives international assistance, the PA has a stranglehold over the Palestinian economy. Money sent is used to fund terrorism and corruption rather than to improve lives. While I have long advocated a new Marshall Plan for the Palestinians, the success of such a plan will depend on ensuring that money is invested only in projects that directly benefit the Palestinians. That will help them re-establish the middle class that is so essential for their future. We'll see if Abbas will make or lose this, the latest, in a long line of "historic opportunities". MK Sharansky's areas of reform, combined with a real ending to terrorism against Israelis, should be a good measure as to where Abbas lies on the road to opportunity. The CBS Panel's internal coverup report regarding Rathergate has now been released. Apparently it was merely caused by a mad rush to get the show to air, nothing to see here, now go watch reality tv ok? # Appoint a senior Standards and Practices Executive, reporting directly to the President of CBS News, who would review all investigative reporting, use of confidential sources and authentication of documents. Personnel should feel comfortable going to this person confidentially and without fear of reprisal, with questions or concerns about particular reports. # Foster an atmosphere in which competitive pressure is not allowed to prompt airing of reports before all investigation and vetting is done. # Allow senior management to know the names of confidential sources as well as all relevant background about the person needed to make news judgments. # Appoint a separate team, led by someone not involved in the original reporting, to look into any news report that is challenged. # Next time CBS should not outsource such an important process as document falsification. CBS should have an IBM Selectric on hand and do the forgeries in house, dammit! This coin, the picture of which is courtesy of Amphora Coins, is a Shekel of the 1st Jewish Revolt against Rome, dated Year 2 (67 AD). Since this is the second year of the Shekel Blog, it seems appropriate that the first coin of the year is a Year Two Shekel. The Coin is silver, and is in extremely fine condition. 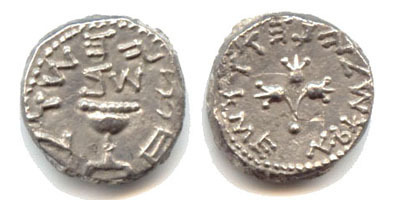 On the obverse is a chalice with the inscription, "Shekel of Israel" and date, "Year 2" in Hebrew. On the reverse is Three pomegranates on stem, with an inscription "Jerusalem the holy." A very impressive coin curently being offered by Amphora for $2,200.00, not bad for a fascinating scarce coin from a fascinating and famous period of history. Thomas Bray of the Detroit News gets it right in calling for any new convention center to be paid for by private funds. In Let private sector finance convention center, he notes that oakland County Executive L. Brooks Patterson is indicating that he will not back a new tax to pay for any convention center remnovation or for a new convention center which is being called for by the Auto show and other promoters. Certainly the auto show is fun to have around, and it may even bolster Detroit's image with a few car nuts. Hundreds of journalists covering the auto industry feel obligated to journey to Detroit in the midst of winter to keep an eye on new car introductions. After all, Detroit is still a very important center of the automotive industry, if no longer its sole "capital." But the auto show already is a lot bigger than it used to be. Yet there doesn't seem to have been any corresponding growth in tourism hereabouts, even with the addition of casinos. Nor has it done much to jump-start development within Detroit. The hard fact is that no amount of new car introductions is likely to overcome Detroit's worldwide image as a pretty sad city surrounded by some very pleasant if unexceptional suburbs. The residents of Bray's very pleasant if unexceptional suburbs clearly do not want to finance another Detroit boondogle and patronage scheme, especially if they will have no voice in the proceedings other than to fork over the money. As reported in The Wall Street Journal's Opinion Journal, the United States is no longer in the top ten countries ranked as most free in the Heritage Foundation's and The Wall Street Journal's Index of Economic Freedom. the U.S.'s fiscal burden, which imposes high marginal tax rates for individuals and very high marginal corporate tax rates. In terms of corporate taxation as an element of economic freedom, the U.S. ranks a lowly 112th out of the 155 countries scored, and its top individual tax rate ranks only slightly better at 82nd. U.S. government expenditures as a share of GDP increased less in 2003 than in 2002, but the rise since 2001 is what explains the U.S.'s decline in score over the period. The US is still in the top 15, so we're nowhere near the world's unfree leader -- North Korea in 155th place -- but the country can do better once Congress and the President get their spending habit in check. I'm unsure about other States across the US, but cities here in Michigan have the unfortunate ability to levy income taxes. Detroit and Lansing, as well as other cities levy these taxes in addition to property taxs. A commuter working, but not living, in the city pays half of the income tax that a resident pays. Now, according to the Detroit news, even more cities are contemplating inflicting this tax on their residents and workers. In Cities eye income tax to plug budget holes the Detroit News reports that Mount Clemens, Ypsilanti and Ann Arbor are considering levying these taxes, with 1% on residents and .5% on nonresidents. The cities are also considering sweetening the pot by dropping property taxes somewhat and to make up for the lower property taxes in non-residents income. Of course, these taxes certainly will not enhance these cites' images as desirable places to work. Raising the burden on workers already hit with federal and state income taxes and local property taxes is hardly going to increase prosperity in these cities and will likely make many potential employees condsider their location when choosing a place of employment. After all if, The tax would cost a typical resident making $38,000 a year in taxable income an extra $370; or a commuter to the city $185. the employee willneed to take that into account.